Dirk may of had a so-so game one, but then again when you're facing a three headed monster there's only so much you can do. Hopefully the Mavs can win a game against the Heat and make this series last longer than their's against the the Lakers. But, no one can doubt Dirk's extraordinarily play during this post season and it seems like he's actually been getting better. 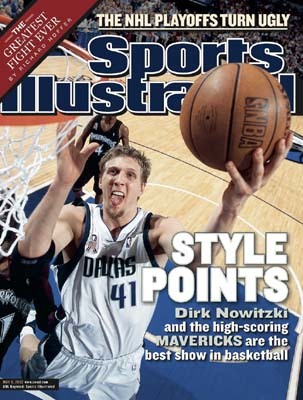 So just how did Dirk go from shooting straight jumpers, to making one legged, leaning 50 degree shots. Nj.com and ESPN were able to capture Dirk working out with his trainer Holger Geschwindner, doing some pretty unorthodox shooting drills. Initially, it was a typical set of shooting drills. Overheads with each hand to warm up. Catch and shoot from mid-range. Right-to-left and left-to-right crossovers at each elbow. High-arc stuff from outer space. • A pirouette at the foul line, spinning 360 degrees off one shoulder and shooting; then reversing the spin and shooting. You get dizzy just watching it. • One-footed jumpers — both right and left, both with leg extended and knee bent — from every mid-range angle, with or without glass. All of it is the kind of up-the-ladder stuff you pull out to finish a game of H-O-R-S-E.
• Something we’ll call the Groucho Marx: He’d take two long strides while still in a crouch, pick up a rolling ball, then shoot. Going both ways. • The Eiffel Tower: Dirk spreads his legs as far as they can go (say, 2½ feet beyond his shoulder width), reach over to touch a foot with both hands, and then catch-and-shoot from that very awkward, open position. This is the one that makes every male shield his eyes.